Carson LumiLoupe 5x Loupe Magnifier - This loupe stand magnifier has pre-focused dual lenses for examination of objects close up, while its transparent acrylic base allows ambient light to illuminate the subject for bright, clear viewing. Perfect for viewing insects, maps, books, stamps, and more! 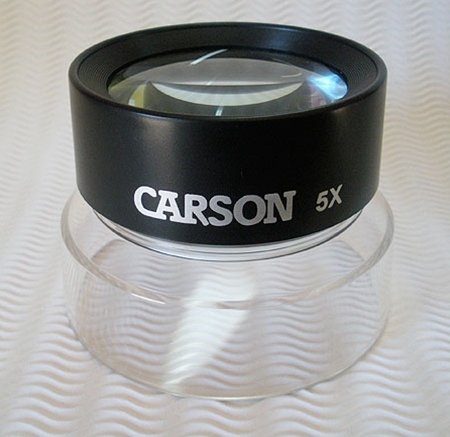 The base measures 4-1/8 inches in diameter and the magnifier stands 3 inches high.